If one day you decide you want to see what a wild tea plant looks like, you could visit the Golden Triangle. On the border between China and Burma you might be lucky enough to come across the famous tea plants, often a hundred years old, that are used to make pu er. You may have to drive for several days to see them. 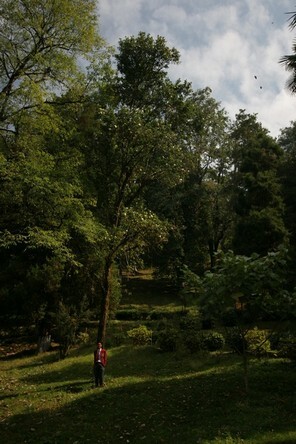 But you will also find a tea plant the size of a tree in Darjeeling, in the Botanic Gardens. It is the same age as the region’s tea plantations, nearly two hundred years old. To give you an idea of its size, I asked someone measuring around 180cm to stand at its foot. Hi Mr Delmas, I apologize for sending this through your blog, but I was hoping to have a chance to meet you personally if you are going to the Xiamen Tea Fair in China this weekend. I’ve been following your blog and am in the process of importing Le Palais Des Thes into China. If you will be attending the tea fair and have 10 minutes available, then I would be very honoured to meet you. My mobile number is 13609624370 and email is kenneth.wong@lemingtrading.com . I sincerely hope to hear from you soon.